How creative should your wedding stage decor be? It’s your wedding day – one of the biggest occasions you are likely to celebrate and certainly one of the most important celebrations to reflect you as individual bride and groom and you as a couple. To ensure that the wedding really has an imprint of your personalities on it, the decor is the key, especially the wedding stage as it is such a focal point. 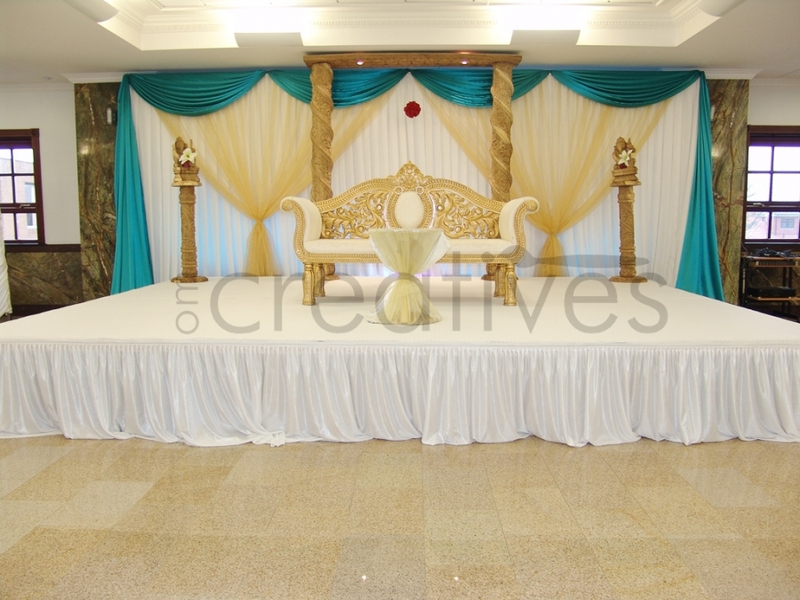 That’s why you as a couple need to ensure that you give enough thought and consideration in to the wedding stage decor. At this time creativity and ideas should be welcomed in abundance. space available – how much space is there to work with without being drowned in the surrounding or obstructive? usage of the stage throughout the day – who will need to access it, how often and when? color schemes – think about the clothes and the table settings; what colours will complement them? textures – using different materials and embellishments brings different textures in to the setting which really create a wow factor and present well in the photographs. lighting – how much natural lighting is there and how much additional lighting will you need to ensure it brings the best out of the stage, the couple and for the photographs – but bear in mind the levels of glare and heat that this can generate. Other than this, the creativity is down to you. As we have been providing Asian wedding decorations for many years, we are well versed in managing all kinds of awkward to grand spaces in to gorgeous stages, so have experts us like can be really beneficial in getting the know-how on how to realise the potential of your ideas. Let your creative juices run wild to start and then let an expert help steer them in to fruition! Hey Riks, Just wanted to say a massive thank you for my beautiful peacock mandap! You made the wedding day that little bit extra special by letting me 'christen' the mandap first! You will be highly reccommended to all my friends and family for your outstanding professionalism and quality of work!! © 2016 OM Creatives. All rights Reserved.